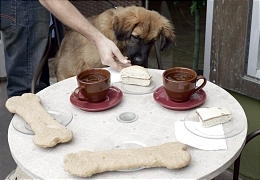 Deseret News took this picture of Mocha, a St. Bernard mix, enjoying a special panini during our grand opening event to benefit No More Homeless Pets in Utah. This was in Deseret News on the front page of “Utah” section on August 22nd. Mocha is the sweetest puppy! He is mellow yet playful, and he is really smart! Someone will adopt him very soon.